Orientation/Registration for the 2015 Citizen's Police Academy will be held in the Training Room located in the Public Safety Center, located at 385 E. Oak Street, Kankakee, on September 1st at 6:30 pm. Class schedules and a firm start date will be determined at the orientation/registration. For more information, please visit our Citizen's Police Academy page here. Kankakee Illinois, Kankakee Police Department made 3 drunk-driving arrests and issued 14 seat belt citations during the recent Independence Day Drive Sober or Get Pulled Over/Click It or Ticket crackdown on drunk drivers and seat belt law violators, said Sergeant Samuel Miller, of the Kankakee Police Traffic Division. Law enforcement agencies throughout Illinois participated in this statewide effort to get drunk drivers off our roadways and encourage seat belt use during the busy Independence Day holiday. Kankakee Police joined forces with state and local law enforcement agencies in conducting the crackdown campaign, which featured high-visibility enforcement combined with a variety of outreach activities, including a media campaign and additional police activity. Extra emphasis was given to the late-night hours when statistics show the highest number of motorists drink and drive and the fewest buckle up. The recent law enforcement crackdown was coordinated by the Illinois Department of Transportation as part of the statewide Drive Sober or Get Pulled Over and Click It or Ticket campaigns. Kankakee – Kankakee Police Department, today announced plans to step up Independence Day traffic enforcement, focusing on both drunk and unbuckled drivers. The intensified enforcement effort will concentrate on late-night hours as statistics show a disproportionate number of traffic deaths occur late at night and involve a drunk driver and/or unbuckled motorist. The crackdown is part of the statewide, Independence Day Drive Sober or Get Pulled Over and Click It or Ticket effort. Kankakee Police Department will join the Illinois State Police and hundreds of police and the Kankakee Sheriff’s departments throughout Illinois in a statewide enforcement effort that begins June 22 and runs through July 5. Make sure everyone in your vehicle wears their seat belt. It is your best defense against a drunk driver. The law enforcement crackdown is funded by federal traffic safety funds through IDOT. On 06-02-15 at about 3:40pm Kankakee Police were called to the east alley of the 1100 block of S. Evergreen in reference to an Armed Robbery that just occurred. As Officers were traveling to the area to investigate, a second Armed Robbery was called in from the west alley in the 1100 block of S. Myrtle. Upon arrival both alleys are the same just on opposite sides of the alley. Police were able to obtain a good identification of 2 offenders, both reported as African American males, in their late teens or early 20's. The victims were also able to obtain the license plate number from the car that was used in the Robberies. An area wide dispatch was put out to surrounding jurisdictions, with the descriptions of the suspects and the vehicle information of the suspect vehicle. At about 3:53pm the suspect vehicle was spotted by Bradley Police in the 200 Block of N. Wabash in Bradley. Bradley Police attempted to stop the vehicle which fled from the officers, but wrecked into a parked car at Blaine and Perry in Bradley. Both suspects exited the vehicle and attempted to flee the scene. Bradley Police arrested 1 suspect almost immediately after a short foot pursuit, while the other continued to flee. At this point Officers from Bradley, Bourbonnais, Kankakee County Sheriff's Police, Illinois State Police and Kankakee Police Department saturated the area of Perry and Wabash. At this point Officers were able to spot the second suspect running west on W. Broadway at Grand Ave. Officers detained the second suspect at Broadway and Grand in Bradley. Both subjects are being initially charged with 2 counts of Armed Robbery, Felon in Possession of a weapon, and numerous other charges related to fleeing from Police in a vehicle. Both suspects are also possibly being identified as suspects in other area crimes and may be charged at a later date. This was a cooperative effort between all area agencies to detain and arrest both suspects. Kankakee Police, Kankakee Illinois, Sergeant Sam Miller; reports (2) DUI arrest, 13 seat belt citations along with 14 cell phone citations written, all of which occurred during night-time hours. The Kankakee Police issued a total of 71 citations for the Campaign. Kankakee Police joined forces with other state and local law enforcement and highway safety partners in the Illinois Memorial Day crackdown. The campaign featured high-visibility enforcement combined with a variety of outreach activities which included a strategic media campaign as well as additional enforcement activity. The Memorial Day crackdown was funded by federal traffic safety funds through IDOT’s Division of Transportation Safety and is part of the Statewide “Drive Sober or Get Pulled Over” and “Click It or Ticket” campaigns. A Public Hearing regarding the Edward Byrne Memorial Justice Assistance Grant (JAG) Progam will be held Tuesday, June 2nd, 2015, at 1:00 p.m. This hearing will be held in the Joint Training Room of the City of Kankakee Public Safety Building located at 385 E. Oak Street, Kankakee, Illinois 60901. This is to consiider the application for the 2015 solicitation for the City of Kankakee and the County of Kankakee. Kankakee, Illinois – Kankakee Police Department will join the Illinois Department of Transportation (IDOT), the Illinois State Police (ISP) and hundreds of local law enforcement agencies across the state for the 2015 Illinois Click It or Ticket campaign which kicks off May 11. During the campaign, officers will be cracking down both day and night on motorists who fail to wear their seat belt in the front and back seat. In Illinois, as of January 1, 2012, all drivers and passengers must wear seat belts in all seating positions in the car, not just the front seat. During statewide observational surveys conducted by IDOT in 2014, the overall usage rate for rear seat occupants was 84.0 percent versus 94.1 percent for drivers and front seat passengers. In 2013, back seat passengers in Illinois accounted for 48 fatalities and over 7,500 injuries. Out of those 48 fatalities, 24 of them were not wearing their seat belt. “Law enforcement will be cracking down on seat belt violators around the clock. Local motorists should be prepared to buckle up. If law enforcement finds you on the road unbuckled anytime or anywhere, you can expect to get a ticket – not a warning. No excuses and no exceptions,” said Sergeant Miller. Provisional numbers show that during the 2014 Memorial Day weekend there were twelve fatalities on Illinois roadways. Three of those fatalities were alcohol-related. Remember – wearing your seat belt is your best defense against an impaired driver. While this year’s Click It or Ticket enforcement campaign runs from May 11 through May 25, officers are out enforcing seat belt laws year-round. Buckle up and encourage your loved ones to do the same. You will save the cost of a ticket and may save a life. On 04-13-15 the Kankakee Police Department was made aware of a possible inappropriate sexual conduct incident between a teacher and a 17 year old student at Kankakee High School. Upon receiving the information, contact was made with the Department of Children and Family Services, Kankakee School District 111 and the Kankakee County States Attorneys Office, which triggered a one week long investigation. During the investigation, evidence was gathered from numerous electronic devices, including computers and cell phones. On 04-21-15 at about 8:15pm, after conferring with the Kankakee County States Attorney’s Office, investigators took Stephen M. DiSanto, W/M, 01-22-73, into custody at his home in Kankakee. DiSanto has been initially charged with Criminal Sexual Assault, and was transported to the Jerome Combs Detention Center, where he awaits formal charges from the States Attorney’s Office. The Kankakee Police Department worked closely with the School District 111, and the Department of Children and Family Services during the investigation, which resulted in the arrest of Mr. DiSanto. The Police Department is awaiting further evidence from electronic devices which must be obtained from service providers and forensic examinations by IT Technicians. KanComm, the combined 911 emergency communications center for Kankakee County, is seeking applicants for the position of Telecommunicator. Applicants who successfully complete a stringent screening process will be placed on an eligibility list to be considered for future openings. Interested parties MUST attend an applicant orientation session to be held promptly at 6:30 PM on Wednesday, March 4, 2015 or 10:30 AM on Thursday, March 5, 2015 at KanComm administrative offices, 2380 W. Station Street, Kankakee, IL. 60901. NO ONE WILL BE ADMITTED AFTER THE POSTED START TIME. The entrance for the orientation session is on the east side of the building. At the orientation session applicants will receive information about the job, application packets and questions will be answered. The Kankakee County Emergency Telephone System Board is an equal opportunity employer. Kankakee, Illinois From December 19 through January 4 of the New Year, Kankakee Police Department will be out in force as part of the annual Illinois “Drive Sober or Get Pulled Over” crackdown on drunk drivers. The statewide crackdown will include high-visibility alcohol and belt enforcement throughout Kankakee. Kankakee Police said its officers will be aggressively looking fordrunk drivers during the crackdown and will arrest anyone caught driving drunk. In addition, front and back seat belt law violators will be ticketed. The Kankakee Police Department is giving fair warning to all partygoers. “You’ll see us out there during this highly visible enforcement period. Drunk drivers will be arrested and those not observing seat belt laws will be ticketed,” said Sergeant Sam Miller. Kankakee Police noted that being arrested for driving drunk brings a wide range of negative consequences into one’s life. Drunk drivers face jail time, loss of their driver licenses, and steep financial consequences such as higher insurance rates, attorney fees, court costs, lost time at work and the potential loss of employment. “Driving drunk is simply not worth the risk. So don’t take the chance. Remember, we will be out in force and we will be watching, so Drive Sober or Get Pulled Over,” said Sergeant Miller. On 12-08-14 at about12:00 the Kankakee Police Department received information of a Facebook rumor circulating on the popular website, in a general posting, that something was going to happen at Kankakee High School at 2:50pm. The Kankakee Police Department in conjunction with the Kankakee School District placed the appropriate security measures in place and school was released about twenty minutes early for the day. The message did not make any direct threats, but made veiled statements that something was going to occur. The obscure statements, were enough to trigger a response from the School District and Police Department. The Police Department will investigate the incident as far as possible, but the posts were allowed to remain on Facebook, and people were able to respond to the post. The Kankakee Police Department has a minimum of 2 Police Officers at the High School at all times, and the School District hires off duty police officers as needed. No incidents were reported, and the early dismissal went as planned. At this point the Police Department is attempting to identify the source of the posting and investigate it to its conclusion. No further information will be released until such time as the investigation is complete. On 11-17-14 at about 6:30pm the Kankakee Police were called to 632 N. Harrison in reference to shots fired and a person hit. Upon arrival officers encountered a shooting victim at the rear door of the residence unresponsive. Several people were in the in the residence and have been transported to the Police Station for questioning. The Kankakee Fire Department was called to render aid to the victim. The victim was pronounced dead at the scene by the Kankakee County Coroner’s Office. The victim is identified as Jermaine R. Burbridge, 01-15-83 with the last known address of 315 N. Evergreen Kankakee. According to witness information an unknown assailant entered the residence, with his face covered by a mask and began shooting inside the home. Evidence indicates that shots were exchanged in both directions both from inside and outside the home. While in route to the scene KAMEG Agents spotted a subject running from the scene and gave chase on foot. The subject ran east through yards and alleyways and ended by forcing his way into 924 E. Willow which is approximately four blocks from 632 N. Harrison. Once inside he advised Officers that he had taken a hostage at gunpoint and barricaded himself inside a west bedroom. Kankakee Police Department SWAT team was summoned to the scene and executed an extraction of the suspect from the bedroom, which was conducted without further incident, and no hostage was found inside the bedroom. Inside the bedroom Officers found that the suspect had punched his way through a connecting wall into another apartment and attempted to kick the exterior wall out to escape. Also evidence revealed that he changed clothes while in the room. The suspect is identified as Dynell L. Gray, 06-25-75 Of Rantoul Il. Gray was transported to JCDC where he is initially charged with Home Invasion. Police are interviewing witnesses to determine if Gray is also involved in the shooting at 632 N. Harrison. Police were able to recover a pistol in the 700 block of N. Rosewood that is believed to be connected to the scene on Harrison, as police re-traced the path traveled by Gray in his attempt to flee from Officers. The Kankakee Police Department would like to thank Kankakee County Sherriff’s Police, Bradley Police, Bourbonnais Police, KAMEG, and The Bureau of Alcohol Tobacco, Firearms and Explosives for their assistance during the incident. This was a group effort that worked very well with all agencies involved. 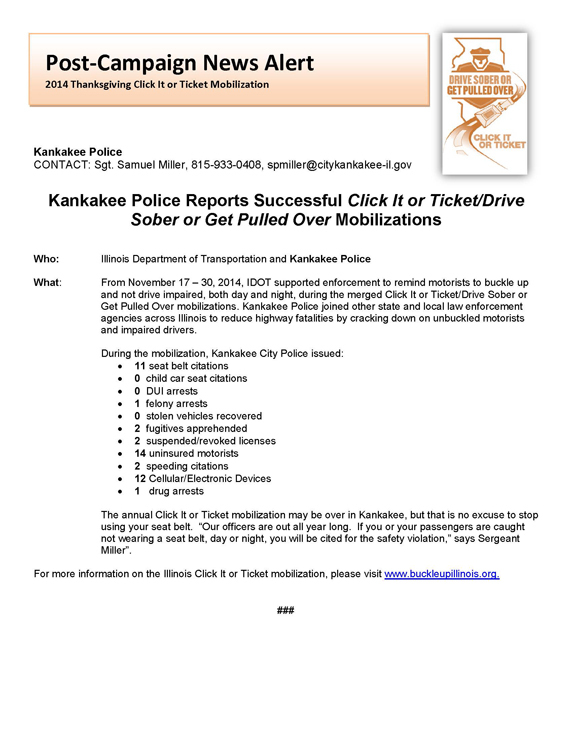 Kankakee, IL – Police and safety officials in Kankakee are reminding residents to fasten their seat belts and drive sober over the Thanksgiving holiday or run the risk of receiving a ticket. The Kankakee Police is joining the Illinois Department of Transportation (IDOT), the Illinois State Police (ISP) and local law enforcement agencies across the state to save more lives by strongly enforcing seat belt and impaired driving laws. On 11-13-14 at about 12:32pm, the Kankakee Police Department was called to the 500 block of East Birch in reference to shots fired. Upon arrival officers located a victim with multiple gunshot wounds inside 515 E. Birch. The victim is identified as Dearrion J. Harris, 07-13-88, with a last known address of 1282 E. Chestnut, Kankakee. Victim was transported to a local hospital for treatment but was later pronounced dead as a result of his injuries. Detectives are on scene and witnesses are being interviewed. It is still very early in the investigation and police are following up leads and evidence recovery. Anyone with information about this crime are asked to call the investigation division at 815-933-0426 or CRIME STOPPERS at 815-93-CRIME. 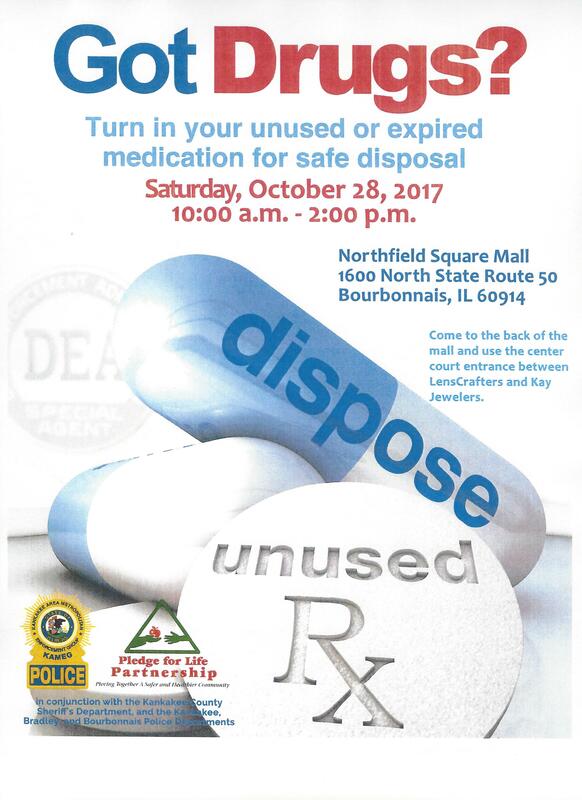 On October 26th, 2014 shortly after 10:00 am Kankakee Police responded to 223 North Evergreen Avenue, Kankakee, II in reference to a shooting victim. Upon arrival of Police a victim was located with and was immediately transported to Presence St. Marys Hospital for medical attention by Kankakee Fire Paramedics. II. A short time later Rowe was pronounced deceased by medical personnel. Kankakee Police Investigators are conducting follow-up investigation. The Police Department is asking anyone with information related to this incident to contact Kankakee Police Investigations Division (815) 933-0426 or Call Crime Stoppers at 93CRIME. Kankakee Illinois This Halloween, Kankakee police will crack down on drunk drivers with an aggressive Drive Sober or Get Pulled Over enforcement effort, and Kankakee Police has given a fair warning to all partygoers: keep the party off the road. “We want people to remember: like ‘Trick-or-Treat;’ ‘Drink-or-Drive.’ One or the other, but never both,” said Sgt. Miller. Before you take your first sip of alcohol on October 31, figure out who your designated sober driver will be. If you wait until you’re ‘buzzed’ to make a decision, you many decide to drive. Buzzed Driving is Drunk Driving, which means that driving “buzzed” brings very serious consequences. According to the National Highway Traffic Safety Administration (NHTSA), Halloween is statistically a dangerous night for drunk driving. In 2012, almost half (48%) of all fatal crashes that night involved a drunk driver. Before the Halloween festivities begin, plan a way to safely get home at the end of the night. If you are impaired, take a taxi, call a sober friend or family member, use public transportation or sleep it off at the party location. If you know someone who is about to drive or ride after drinking, take their keys and help them make safe travel arrangements to where they are going. The law enforcement crackdown is funded by federal traffic safety funds through the Illinois Department of Transportation. Urbana, Ill. – A Kankakee, Ill., man, Joshua N. Bisping, 33, has been ordered to serve 10 years in federal prison for his engagement in a murder-for-hire plot against his ex-wife, as announced by U.S. Attorney Jim Lewis, Central District of Illinois. U.S. District Judge Harold Baker today sentenced Bisping to the statutory maximum sentence and ordered that Bisping remain on supervised release for three years following his release from prison. Bisping was also ordered to have no direct contact with the victim. On May 29, 2014, Bisping pled guilty to use of interstate commerce facilities in commission of a murder-for-hire plot. One year earlier, in late May 2013, Bisping attempted to hire an individual to kill his ex-wife. The individual introduced Bisping to an undercover ATF agent posing as a hit man. Following the meeting, Bisping met in person with the undercover agent on at least three occasions which were video and audio recorded. During the meetings, Bisping discussed paying the undercover agent $5,000 to murder his ex-wife and to make it look like a robbery gone bad. Bisping and the agent discussed Bisping’s obtaining a picture of his exwife for the agent, establishing an alibi for the time of the murder, and, if questioned by police, Bisping’s denial of any knowledge of the murder-for-hire plot. After one meeting, Bisping and the agent drove by the ex-wife’s residence so the agent would know where she lived. Bisping was arrested in early June 2013, and has remained in the custody of the U.S. Marshals Service since his arrest. The case was investigated by the Kankakee Area Project Safe Neighborhoods Task Force; the Bureau of Alcohol, Tobacco, Firearms, and Explosives; the Kankakee Police Department; and the Kankakee County State’s Attorney’s Office. Assistant U.S. Attorney Eugene L. Miller prosecuted the case. 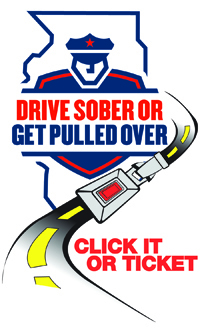 Kankakee, Illinois -"(Kankakee City Police) made (4) impaired driving arrests and issued (SS) safety belt citations during the recent Labor Day impaired driving crackdown," said (Sergeant Sam Miller). All (4) of the impaired driving arrests were made after midnight, and the (55) of safety belt citations were issued after 9 p.m.
Law enforcement agencies throughout Illinois participated in this nationwide effort to save lives by getting impaired drivers off our roads and more people buckled up during late-night hours. (Kankakee City Police) joined forces with other state and local law enforcement and highway safety partners in conducting the crackdown campaign featuring high-visibility enforcement combined with a variety of outreach activities including paid advertising and over $1 million in additional police activity. Extra emphasis was given to the late-night hours when statistics show the most people drink and drive and the fewest buckle up. The recent law enforcement crackdown was funded by federal traffic safety funds through IDOT's Division of Transportation Safety and is part of the statewide "Drive Sober or Get Pulled Over” campaign. On 07-21-14 at about 3:54pm the Kankakee Police Department received an alarm at Homestar Bank 255 E. Station. Upon arrival, officers learned that an individual had exited the bank with an undisclosed amount of money after taking it from a teller. Officers began an expanded search for the suspect who was described as a black male in his 30’s wearing a black t-shirt and white shorts. Officers then located a subject at 1067 E. Bourbonnais, who fit the description of the suspect and approached him. Upon making verbal contact with the subject he immediately fled from the scene. After a brief foot chase officers were able to detain the subject, identified as Brady L. McNeely 08-26-90, of 1067 E. Bourbonnais. McNeely was positively identified as the suspect from the bank and placed in custody. McNeely was found to have a large amount of money on his person. McNeely was transported to Jerome Combs Detention Ctr. where he was initially charged with felony Theft. McNeely will be additionally charged with retail theft from Jewel Foods on S. Washington Ave, which occurred on Friday, 07-18-14, and a charge of Domestic Battery which occurred on Sunday, 07-20-14 at his residence. A public hearing regarding the Edward Byrne Memorial Justice Assistance Grants (JAG) Program will be held Tuesday, July 15, 2014, at 6:30 11:30 a.m. This hearing will be held in the Joint Training Room of the City of Kankakee Public Safety Building located at 385 E. Oak Street in Kankakee, Illinois, 60902. 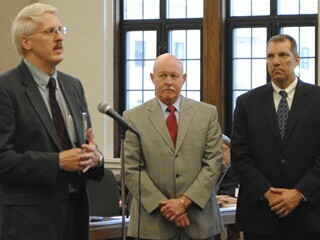 This is to consider the applications for the joint solicitation of the City of Kankakee and the County of Kankakee. On 06-15-14 at about 11:37am the Kankakee Police Department was called to the 300 block of South Rosewood in reference to shots fired and a subject down. Upon arrival Officers located a victim lying in the street in the 300 block. The victim is identified as Lucien S. Sherrod, 41 years of age, with a last known address of 200 N. Myrtle Kankakee. Mr. Sherrod was shot numerous times, and taken to a local hospital to be treated, and is currently listed in critical condition. According to witnesses, Sherrod was approached by an unknown black male who fired at Sherrod, with a pistol, and then fled the scene in a black SUV. No further information is available at this time and Police are searching for more information related to the shooting. Persons with information should call 815-933-0426, or CRIME Stoppers at 815-93CRIME. The Kankakee Police will release further information as it becomes available. From May 9-26, 2014, IDOT supported law enforcement agencies statewide to remind motorists to buckle up both day and night during the Click It or Ticket seat belt enforcement mobilization. Kankakee Police joined other state and local law enforcement agencies across Illinois in this annual effort to get more motorists to buckle up, in the front and back seat - and save more lives. The annual Click It or Ticket mobilization may be over in Kankakee, but that is no excuse to stop using your seat belt. “Our officers are out all year long. If you or your passengers, in the front seat or back seat, are caught not wearing a seat belt, day or night, you will be cited for the safety violation,” says Sergeant Sam Miller”. For more information on the Illinois Click It or Ticket mobilization, please visit www.buckleupillinois.org. On 05-19-14 at about 2:01am, officers were called to the “What Ever Bar” located at 360 S. East Ave in reference to shots fired. Upon officers arrival, they found a very large crowd outside engaged in numerous fights. Officers called for assistance from Kankakee County Sheriffs Police, Bradley Police Dept., Bourbonnais Police Dept, and Illinois State Police, due to the amount of people. Officers located two victims who were shot, and a suspect was taken into custody, after being beaten by witnesses. Victim #1 is identified as Laroy McDaniel of Kankakee, 09-12-86, and Victim #2 Robert Scott III also of Kankakee, 02-25-94. Two victims were also transported to local hospitals by private vehicle are identified as #3 Robert Scott Jr. 07-31-61, and #4 Shekila Boyd 10-27-86. The suspect is identified as Jesse Villagomez of Kankakee, 02-24-88. Police also recovered a pistol at the scene believed to be the weapon used. Police learned that Leroy McDaniel died at the hospital of wounds received during the incident. Later at 3:14am police responded to 174 N. Evergreen in reference to shots fired, where a shotgun appears to have been used to shoot at the residence. At 3:15am Police hear more shots fired in the area of 355 E. Bourbonnais, and received a call of a gunshot victim at 431 S. Indiana. There police find Jeffery A. Davis of Bourbonnais, 04-09-81 shot once in the leg. At 355 E. Bourbonnais police find a vehicle that had been damaged by gunfire, and spent shell casings. At 3:15 am police observe an older Chevy Van leaving the area at a high rate of speed. Upon stopping the Van at Schuyler and Station one passenger bails out of the van and attempted to run away, and officers could see that he is armed with a pistol, he was apprehended in the 200 block of S. Schuyler and the pistol was recovered. Sentray D. Coney, 10-17-89 of Kankakee is arrested and transported to JCDC. Also arrested in the van are Jeremy E. Hoover 11-18-85, Maurice Boyd 12-15-85, Teondre L. Shannon 11-09-85, Anthony L. Boyd 01-06-95, and Antonio D. Thomas 05-15-80, all of Kankakee. This release is being made in reference to the bar fight at the City Tavern on 04-12-14 at 2:05am, in which Aaron Mclain received very serious head injuries. This release is being made to shed light on a situation that was reported incorrectly on social media and used to divert attention from the actual truth. During the course of this investigation, Investigators literally had to track down 16 of the approximately 30 people that were present and request them to come in for interviews. Each one of the witnesses, suspects, and victims had to show their location on the video, and explain their actions to investigators after being interviewed. The result of the investigation also reveals some victims who are also suspects, and many witnesses who were actually involved in the alcohol fueled melee. For the record, the Kankakee Police and KanComm received only two calls to 911 from the City Tavern in reference to this incident, one from a bartender, and another from Austin Boswell using racially charged language after Aaron Mclain was knocked unconscious. This account of the incident is an abbreviated version of the entire incident but explains the situations high points. On 04-12-14 at about 1:00am, Mr. Mclain’s group arrives at the City Tavern, at the end of a night of drinking in at least one other location. Shortly after arrival Aaron Mclain and Austin Boswell confront a patron about being bumped or pushed at some point after their arrival. Words are exchanged between the patron, Mclain and Boswell. At some point during the argument the patron walks away and he is ridiculed by Mclain and Boswell. At this time a racial epithet is used by either Mclain or Boswell, and the patron is escorted out of the City Tavern by two African American patrons who fear for the safety of the patron. Another African American witness tells investigators that he knew the night was not going to end well. Because of differing statements racial epithets are said to be used as the patron drives away from the bar, but not all witness statements refer to this incident. Bar personnel then ask the Mclain party, consisting of four people, to leave the City Tavern. Shortly after their exit, the lights come on in the City Tavern, and the bar is cleared for closing time. As patrons begin to leave, the Mclain party is still outside in front of the tavern, and there is a commotion there. This is the point where the Facebook video begins, what follows is numerous fights between African Americans, the Mclain Party, and other people in the bar, both males and females. Mclain is actively seen on the video swinging his fists at individuals, and being swung upon by persons. Austin Boswell is seen striking an individual, knocking him to the ground. At this point an individual arrives in the picture and takes his shirt off and hands it to a female. He runs toward the south parking lot, where the numerous fights have moved to. Mclain is no longer in the picture nor is the individual who has taken his shirt off. Several of the witnesses identify the individual with his shirt off as the person that struck Aaron Mclain. People are then heard calling for Mclain and a passer by saying he is knocked out between the cars. The police then begin to arrive and the video is stopped. Witnesses tell investigators that Aaron Mclain was struck one time by the individual with his shirt off. Investigators have identified the person, and have interviewed him. At no time was Mclain struck by numerous people or beaten down by a group of people. Investigators examined his body while he was in the hospital and the only injuries he sustained other than his severe head injuries were a small laceration near the bridge of his nose, and a scrape on his knee. He had no bruising to his body or limbs, or other injuries consistent with being beaten by a group of people. The Kankakee Police Department will submit the results of our investigation to the States Attorney’s Office for review on Monday 05-12-14. We will be asking that charges of Mob Action be filed against 8 persons involved in the fight. There are more serious charges of possibly Aggravated Battery that may apply to the shirtless man. At this point we will leave the case in the hands of the Kankakee County States Attorney and abide by his decisions for charging the actions of these individuals. The Kankakee Police Department has found a vastly different scenario related to this case, and its video, than was broadcast on Facebook. Kankakee, Illinois, if you think you can travel in Illinois over Memorial Day without wearing your seat belt- think again. The 2014 Illinois Click It or Ticket campaign kicks off May 9. The Kankakee Police Department is joining the Illinois Department of Transportation (IDOT), the Illinois State Police (ISP) and hundreds of local law enforcement agencies across the state to save more lives by strongly enforcing seat belt laws. In Illinois, as of January 1, 2012, all drivers and passengers must wear seat belts in all seating positions in the car, not just the front seat. During statewide observational surveys conducted by IDOT in 2013, the overall usage rate for rear seat occupants was 77.4 percent versus 93.7 percent for drivers and front seat passengers. In 2012, back seat passengers in Illinois accounted for 46 fatalities and over 5,000 injuries. Out of those 46 fatalities, 30 of them were not wearing their seat belt. Provisional numbers show that during the 2013 Memorial Day weekend there were three fatalities and almost 600 injuries on Illinois roadways. Two of those fatalities were alcohol-related. Remember – wearing your seat belt is your best defense against an impaired driver. While this year’s Click It or Ticket enforcement campaign runs from May 9 through May 26, officers are out enforcing seat belt laws year-round. Buckle up and encourage your loved ones to do the same. You will save the cost of a ticket and may save a life. 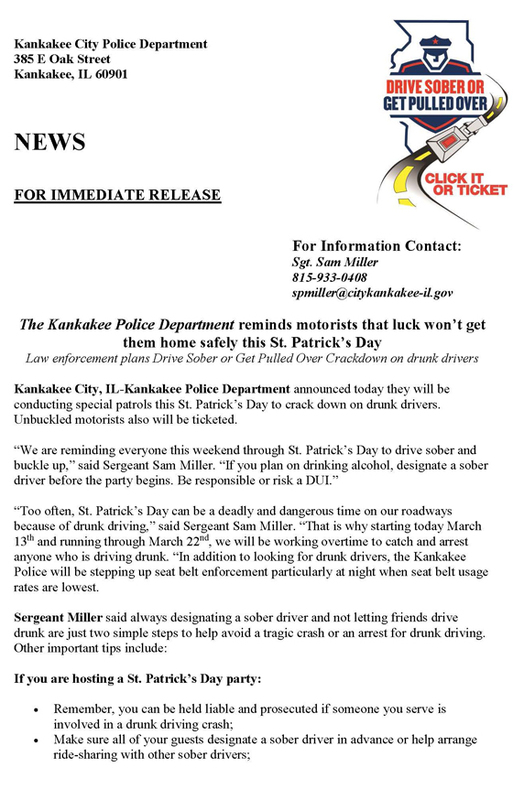 Kankakee Illinois – “Kankakee City Police” made at least two drunk-driving arrests during the recent St. Patrick’s Day crackdown,” said Commander Matt Adamson”. Both drunken driving arrests were made after midnight. In addition, 30 citations were written for Cell phone usage and 21 seat belt citations were written, 6. % of which occurred during nighttime hours. 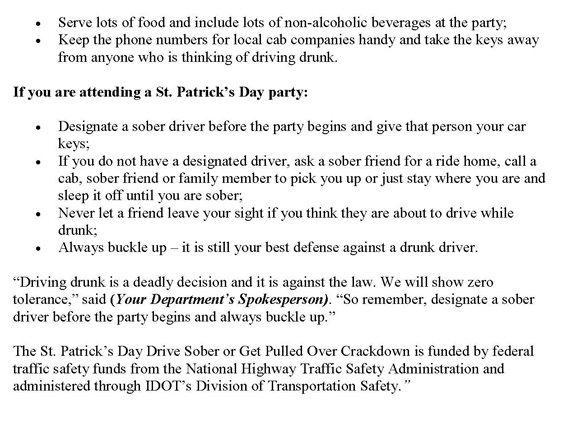 Kankakee City Police joined forces with other state and local law enforcement and highway safety partners in the Illinois St. Patrick’s Day campaign. The campaign featured high-visibility enforcement combined with a variety of outreach activities which included a strategic media campaign as well as additional enforcement activity. The crackdown took place as data shows a recent increase in drunken driving fatalities in Illinois. This law enforcement crackdown was funded by federal traffic safety grants through IDOT’s Division of Traffic Safety and is part of the statewide “Drive Sober or Get Pulled Over” and “Click It or Ticket” campaigns. On 03-06-14 at about 8:38pm the Racine WI Police Department in cooperation with the Kankakee Police Department arrested 19 year old Rachard D. Butler on a warrant for the November 23, 2013 murder of Kenneth Groves. Mr. Groves was killed after being shot at a house party in the 300 block of S. Evergreen Ave. Working from evidence recovered from the scene and witness information the Kankakee Police quickly identified Mr. Butler as the suspect, and received a warrant for his arrest. Working from information provided by the Kankakee P.D., Racine Police were able to identify Butler and took him into custody during a traffic stop in Racine. Butler is being held at the Racine County Jail awaiting extradition back to Kankakee to face the Murder Charge. The Kankakee Police wish to thank the Racine Police Department for their cooperative efforts, and their investigation that led to the arrest of Butler. The Kankakee Police Chief, Larry D Regnier announces that from November 17th to November 30th the Kankakee Police Department along with KAMEG, and the investigators from Project Safe Neighborhoods, have recovered 13 guns in the course of the above mentioned 2 week period. While none of the weapons or the arrests that have ensued can be linked to any one specific event, the Chief feels that these arrests will curtail at least some of the violence that has been reported during this time period. The department feels that the arrests are significant in that there are now fewer guns in the hands of individuals who may have intended to use them for illegal activities. During this 2 week period the Kankakee Police Department recovered 6 weapons, Kankakee Metropolitan Enforcement Group recovered 3, and Project Safe Neighborhoods recovered 4 as a result of continued investigations . Chief Regnier wanted to reassure the Citizens of Kankakee that Officers from the various agencies that assisted in the above mentioned recoveries remain vigilant and focused on their commitment to protect its citizens. Kankakee Police are currently conducting a death investigation concerning the death of a 22 year old special needs female who was found deceased in her family’s home located in the 300 block of W. Jeffery Street in Kankakee. On 11/27/2014, at approximately 1:40 a.m., police and EMT’s responded to the address after a call was placed by the victims’ family member who reported she had stopped breathing. The investigation, which is in conjunction with the Kankakee County Coroner’s office, is ongoing and no further information is available at this time. More information will be released when it is available and will not hamper efforts of investigators. On 11-23-13 at about 1:12am the Kankakee Police were called to the 300 block of S. Evergreen in reference to shots fired. Upon arrival officers found approximately 100 people in the street scattering from what appeared to be a house party at 361 S. Evergreen. Officers were able to locate 2 shooting victims who were in the 300 block of S. Evergreen. Both subjects were transported to area hospitals for treatment. 1 subject was treated for non-life threatening injuries, and the other was pronounced dead in the emergency room. The deceased subject is identified as Kenneth M. Groves, 09-15-93, of 1042 S. Monitor Chicago II. Detectives are on the scene processing for evidence and conducting interviews of witnesses. While still at the scene, at 3:02am, officers responded to shots fired at Taylor Ave and Oak St. Upon arrival, officers located bullet holes in a house located at 185 N.Taylor Ave. No one was injured at this location, as no one was at home at the time of the shooting. Police believe this incident is related to the shooting in the 300 block of S. Evergreen. call the Kankakee Police Department at 815-933-0426 or Crime Stoppers at 8l 5- 93CRIME. Further information will be released through press releases from the Police Department as it is available. POLICE ASKING FOR WITNESSES IN SHOOTING INCIDENT ON OCT. 4, 2013. Anyone who has information about the identity of any of the three subjects depicted in these photos is asked to contact KPD Investigations at 815.933.0426, CrimeStoppers at 815.932.7463 (92-crime). You can also leave anonymous tips through our website (www.kankakeepolice.com) or on one of our social media sites. This armed robbery occurred August 6th, 2013 at approximately 6:30 p.m. in the 600 block of E. Court Street. On July 25, 2013, at approximately 10:25 p.m., Kankakee Police responded to the area of E. Chestnut and N. Wildwood in reference to a shooting victim. Officers located and spoke with the victim, a 20 year old Kankakee resident who had non-life threatening injuries. The victim was transported to a local hospital for treatment. This is still an ongoing investigation. More information will be released when we are able to do so without hampering the ongoing investigations. Anyone with information about this or other crimes is asked to contact the Investigations section at (815) 933-0426, through Crime Stoppers at (815) 93-crime, or message us here or on one of our social media sites. Ernie Knight, from the Commission on Accreditation for Law Enforcement Agencies (CALEA) presented the KPD with their 2nd accreditation award at the June 17th, 2013 City Council meeting. Mr. Knight explained that not only did the KPD receive the award after an exhaustive examination of standards set by CALEA, but it was found that KPD was 100% compliant with all standards set for agencies. Having received this award for the second time, KPD continues its tradition of being one of only two agencies in the State of Illinois having a dual accreditation from CALEA and the Illinois Law Enforcement Accreditation Program (ILEAP). May 28th, 2013, just after 10:00 p.m., Kankakee Police responded to a call of shots fired in the 300 block of N. Wildwood Avenue. Upon arrival, officers found an apparent gunshot victim identified as Orlando C. Wilson. Mr. Wilson was a 26 year old black male who lived in the 300 block of N. Wildwood Avenue in Kankakee. Mr. Wilson was pronounced deceased a short time later at a local hospital. Investigators believe a male subject armed with a handgun approached Mr. Wilson outside of Mr. Wilson’s residence, and shot Mr. Wilson. The male subject then fled the immediate area on foot. Anyone with information is asked to contact investigators at 815.933.0402, through our website contact us form, Facebook, Twitter, or through Crime Stoppers at 815.93CRIME (933-1469). It is our policy to update Press Releases in a timely manner to provide as much information as possible to the public without compromising any current investigation that may be in progress. Thank you for checking, and please feel free to follow us for daily bulletins on our social media pages which may contain information that we do not release in the form of a press release.